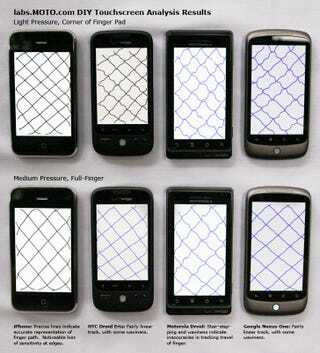 MOTO Development Labs devised a simple method of analyzing capacitive touch screens using drawing programs. They put the iPhone, the Nexus One, the Droid, and the Droid Eris through the paces and proved not all touch screens are created equal. Using only your fingers and a drawing app, MOTO shows how you can test out the accuracy of your smartphone's touch screen. The test is simple: draw some slow, steady lines across the screen with your finger. If they're smooth and straight, your touch screen is tracking with relative accuracy. If they're wavy or jagged, your phone might not be giving your fingers the attention they deserve. MOTO's test showed the iPhone tracking the most accurately of the four, with smooth, straight lines. The Motorola Droid fared worst of the bunch, its crossing lines tracking so jaggedly that the screen looked like a jigsaw puzzle. The Eris and the Nexus One landed somewhere in between.